All pneumatic systems use compressed air to operate and move parts or actuators. These systems like pneumatic valves range from simple air-driven pistons to multiple actuator mining operations. They commonly use compressed atmospheric air because of the abundance and inexpensiveness. Due to their ease of use, quietness and cost-efficiency, they are generally preferred over liquid-using hydraulic systems. Check Valves. These are one-way valves that are installed to the hose, which connects the compressor to the buffer tank. They let the compressed air gather in the buffer tanks, but prevent backflow into the compressor tank. Compressor. It is a mechanical device that increases the pressure of air by reducing its volume. This is a pump powered by gas or electricity. It compresses the air to a higher PSI (pounds per square inch). Compressors have a tank connected to store the air before it’s released into the pneumatic track. An air compressor is a specific type of gas compressor. Regulators and gauges. These are equipment that is connected to the compressor or compressor tank. To release air into the pneumatic track, the regulator is electrically or mechanically triggered. Gauges are also electric or mechanic measuring instruments. They let the computer system or operator to regulate and check the PSI of the air inside the compressor. Accumulator or buffer tank. Buffer tanks are secondary storage units for the compressed air that came from the compressor. They are storing the high-PSI compressed air for the pneumatic actuators. These tanks help in preventing irregular airflow surges in the actuators, allowing the compressor cycle to maximise its shutoff timing. They also allow the compressor to be in the exact distance from the actuators in projects. Feed lines. These are hoses that move the pressurised air through the pneumatic system. The largest diameter hoses are installed to handle the PSI. These large hoses allow the pressurised air to travel faster, eliminating the airflow backups. Actuators. These are the components of the pneumatic system that do the hard work. Many types of actuators are powered by pressurised air. The most frequently used are cylinder and plunge. The pressurised air is released into the cylinder to make a piston move forward as the air is forced to the chamber. 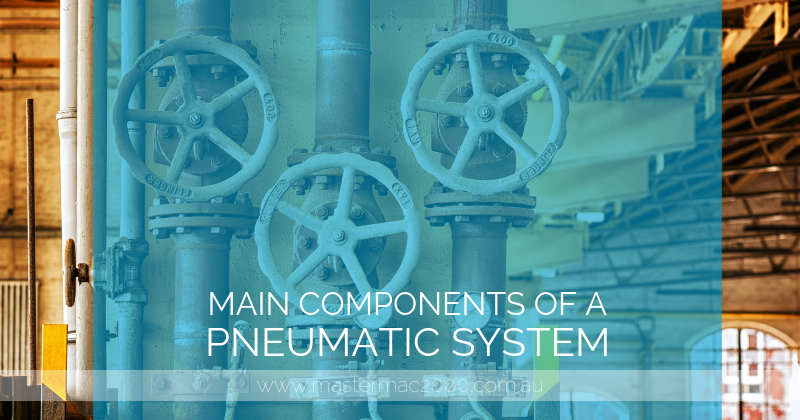 These are some of the main components of a pneumatic system. To fully understand the system, you need to know how every component works. Knowing their specific functions will help in preventing problems during work. If you need pneumatic valves, Mastermac2000 can provide you quality pneumatic products. Contact us now!